Released October 2nd, 2012, this book is a fantastic treasury of the older ways in which things were done. The authors, Ken Albala and Rosanna Nafziger (who previously wrote The Lost Art of Real Cooking), are not off-the-grid, animal keeping, crop planting people. But, they are enthusiastic about old-fashioned methods of self-sufficiency. Honestly, they had me when I discovered they had a recipe for Injera. I have fallen in love with Ethiopian cuisine. But, I never could figure out how they made their lovely pancake like bread. Thanks to this book, I can now make it at home! This book is really quite fabulous. No need to live in a commune or move into the mountains to use the recipes and instructions! With this book you will learn how to make your own Kombucha, Birch Beer & Apple Cider Doughnuts. Or, you can venture outside of the kitchen and learn the art of rug braiding, soap making, herb gardening, quilting, broom making and much, much more! My favorite part of this book though is not the instructions (which are excellent). The book is written with so much love that I felt as if I was having a conversation with my great-great grandmother. I never met her, but she would have been able to teach me the lessons in this book. In a way, this book enabled me to reconnect with lost traditions and recipes. 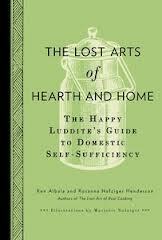 I know that I will be referencing The Lost Arts of Hearth & Home for years to come! I highly recommend this book for anyone in your life who either has a fascination with old-fashioned techniques or who enjoys making things from scratch. The young urban professional who likes kombucha and homemade bread will be thrilled to learn how to make their favorite items. The mom who likes cider, but not the price in local grocery stores, will love to learn how to make her own. Not to mention that this book covers the topic of sewing so well that anyone who is tired of paying their local seamstress top dollar prices for hemming a pair of pants will be very glad for the tutorial! Priced at $23.00, you can pick this book up at the usual big book stores in your town. For those who love the convenience of Amazon (and the savings), you can purchase yours Here! Note: The Penguin Group supplied me with one copy of The Lost Arts of Hearth & Home for review. No other compensation was received. The review in this post is honest and my own.